It’s back! Our annual Family Day FunZone is on! 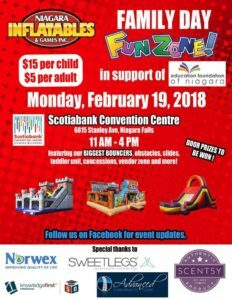 Join Niagara Inflatables for our Annual Family Day FunZone. This year it will be in support of the Education Foundation of Niagara. ​The event will be held at the Scotiabank Convention Centre located at 6815 Stanley Avenue, Niagara Falls, ON, L2G 2A6. From 11 am​ ​- 4 pm you can bounce on our biggest bouncy castle​s​, ​try out our giant obstacle course​, slide down the 20′ Challenger Slide and try our Fantasy Sports Games. We will also have other great activities such as face painting​ and browse​ our vendor zone​. $15 per child (4-12 years) $5 per adult (13+). Proceeds are donated to the Education Foundation of Niagara.